Dr. Stella Kafka, Director of the American Association of Variable Star Observers (AAVSO), spoke to our club at the April 2018 public meeting. She told us about the different kinds of variable stars and how observing them is a rewarding scientific pursuit. Founded in 1911, amateur astronomers have contributed over 30 million observations to the AAVSO! 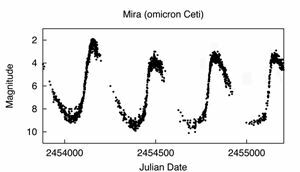 Professional astronomers use the observations for many reasons, e.g., to schedule observations by the Hubble Space Telescope of a variable star during a particular phase of its activity. The AAVSO has a variety of observing sections, including exoplanets, eruptive variables, pulsating variables, young stellar objects, eclipsing binaries, and the sun. Headquartered in Cambridge, Massachusetts, the AAVSO has members from around the world. AAC member Andy Howell (andy.howell@alachuaastronomyclub.org), who is a long-time AAVSO variable star observer, would be happy to help any interested AAC member get started in variable star observing.